In Alta Maremma, in the municipality of Roccastrada border between the provinces of Siena and Grosseto between forests Torniella is a small medieval village built around the year 1000. Fortress in the town is the castle of the Counts Ardengheschi, the vassals the Aldobrandeschis. Casa Reasco consists of 2 independent apartments in total we can accommodate groups of up to 8 (or more if you use the sofa bed). This makes it an ideal home for families Casa Reasco also numerous holiday together and bike tours and bike. A locked garage is available for storage of bicycles or motorcycles at night. 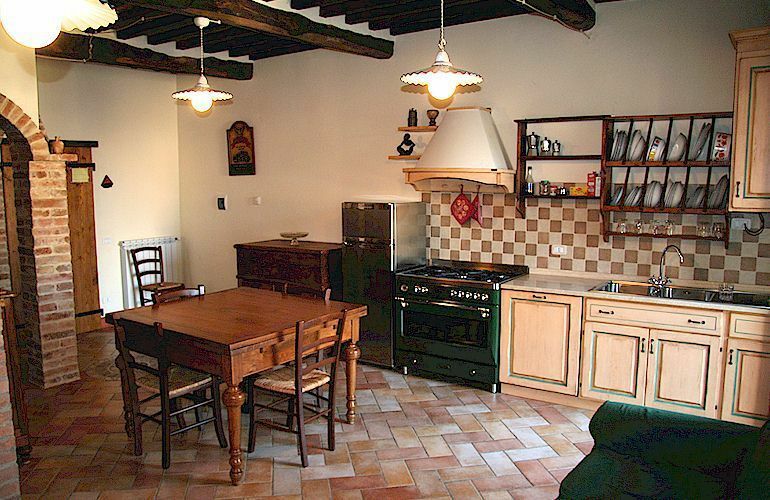 Casa Reasco has been renovated in a traditional style with wooden beamed ceilings and terracotta flooring. Ground floor master bedroom with bath on the first floor of the apartment CASTAGNA with 2 bedrooms, 1 living room, 1 bathroom; PORCINO second floor apartment with 1 bedroom, 1 bathroom and a large living room kitchen with dishwasher, sofa bed. T.V. sat. and heating included, free WIFI. In common there are laundry and garden located at the rear of the house is about 300 square meters with gazebo and barbecue. The parking for cars is convenient because there is a square in front of the house. You can reserve a rental biciclette.Nel village there are shops, bars and a pizzeria restaurant. From Florence: take the superstrada Florence-Siena and upon reaching Siena proceed towards Grosseto. Exit at Civitella Marittima and proceed to Roccastrada and then follow the signs for Torniella. From Rome: take the autostrada A12 for Grosseto, and then continue in the direction of Livorno exit at Braccagni and proceed to Roccastrada and then follow the signs for Torniella. Nel periodo fine anno non è compreso il riscaldamento nel prezzo dell'affitto.